United Air Lines Special Travel Authority Pass dated 1967. 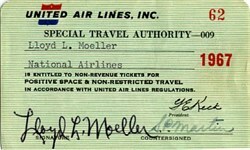 The pass was issued to L. L. Moeller, Director of Agency and Interline Sales for National Airlines and has the printed signature of United's President G.E.Kick and S.P. Martin.